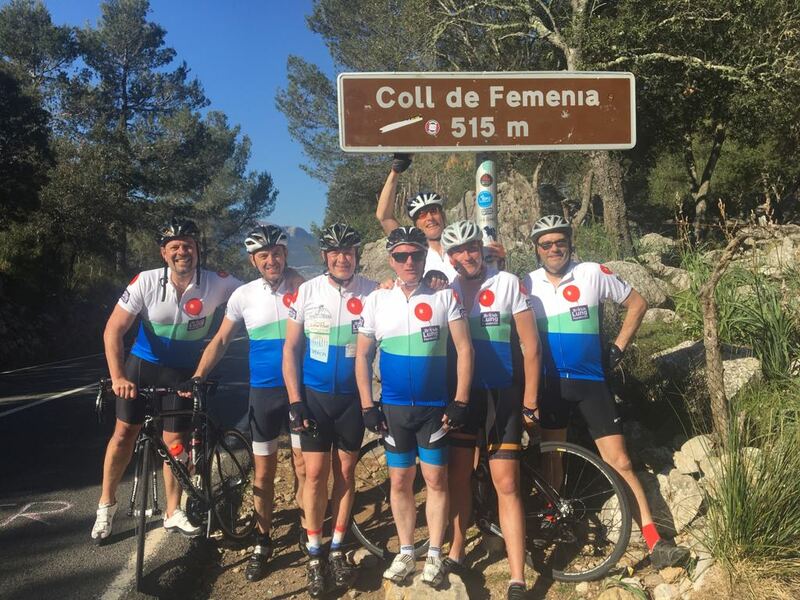 After a hearty breakfast the boys set off out of town and headed out towards Coll De Fememia. This was retracing the route from the finish yesterday, a gradual steady climb for the first 30 minutes before hitting serious ramp ups. Ultimately the climb was 515m in elevation gain and 20km in length in sweltering but gorgeous morning sunshine. Hugely steep in places, it was busy with cyclists and the odd crazy Spanish coach driver trying to squeeze past. Once all met at the top it was time to head off to the Lluc Monestary for a sneaky coffee and cake stop, before climbing back up and out of town. The talk was that it was downhill from here, this was not the case. A small matter of an additional climb up the Coll dels Reis, with an elevation of 682m, was an unexpected little ‘extra’ for the legs to contend with. This was all the more impressive as Ben, Simon, Mark, Nobby, JB and Macca had all completed yesterday’s 150km ride. To come back out today feeling positive in the searing heat, no breeze and challenging climbs was very positive and helped the teams self belief. Now, the big one of the day. The Coll dels Reis took us to the top of Sa Calobra, from here there was only one way down…into the town of the same name all they way down to sea level. Apparently this was voted the no.4 best mountain to cycling on in Europe…this was breathtaking…goodness only knows what the top 3 will be like! Lunch was eaten in a sober atmosphere, each of the guys mentally preparing for what would prove to be the ultimate challenge of the weekend. Lunch was eaten in a sober atmosphere, each of the guys mentally preparing for what would prove to be the ultimate challenge of the weekend. Whilst Puig Major was a category 1 climb and tough, it was uninspiring. 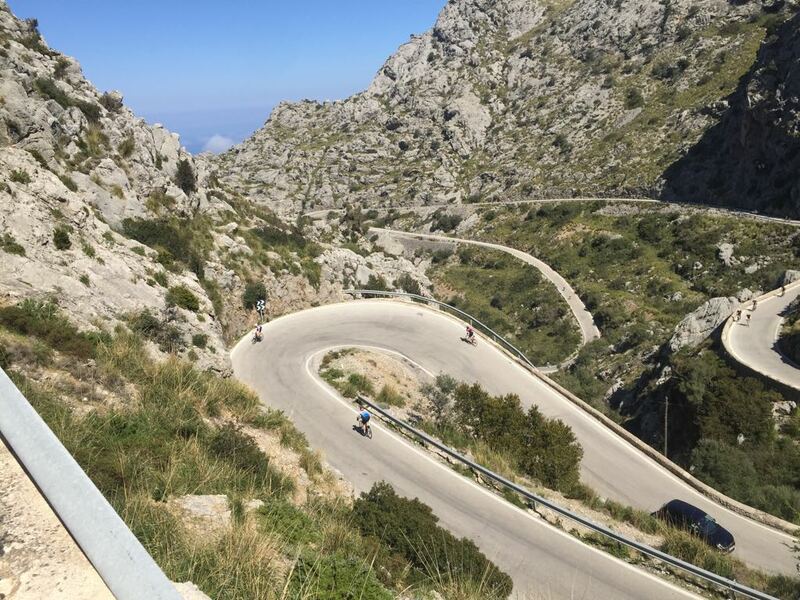 Sa Calobra was something totally different, it was totally unlike anything any of the Peaky Climbers had ever experienced before. 1.00pm, there was no point putting off the inevitable. After a few photo’s the guys all headed off as a team, to take on the massive 10km climb, with an average gradient of 7.7% in 84 degree heat. It was all about keeping calm and composed. Nobby, as always, lead the way. Smoothly turning his pedals, maintaining a cadence that would see him arrive at the top in an impressive 53 minutes. After yesterday’s personal challenges Mark rode Sa Calobra very impressively. Learning lessons the hard way yesterday, today he took on plenty of fluids and the right food, and started the climb patiently. Hitting his rhythm by half way, the steeper second half was dealt with comfortably as he arrived at the top 4 minutes after Nobby. As proved the case all weekend, JB and Macca were climbing buddies and, once in the groove, kept the momentum going throughout. Celebrating slightly prematurely as they passed the cafe under the arch, but soon found out they had another 1k of steep climbing to do. Macca completed in 59 minutes, JB a couple of minutes back. Ben, Simon and Stewie kept pushing all the way to the top. The heat was intense, the lack of breeze and shade making it tougher, but the guys got to the top 1hr 12. (Ben), 1hr 14(Simon) and 1hr 16 (Stewie). The sense of emotion and satisfaction upon achieving this goal, both as a team and individually, was there for all to witness. The odd tear shead, many team hugs and high 5’s were all in evidence…the exhilaration, and sense of achievement was palpable. After a few minutes, it was back on the bikes and we headed off back towards the ‘cyclists garage’ for a sneaky celebratory beer. The last 39k was swift as we decended down the Coll de Sa Batalla to Camperet. After few few mix ups with the directions, we headed up and out and en route back home to Pollenca. This was a road for cyclists, but was the worse track we’d cycled on all weekend…the rest of the roads were superb. 10k from home Simon and Nobby latched on to some speeding locals and they shot home at an alarming rate, averaging 25mph into a headwind…hugely impressive. 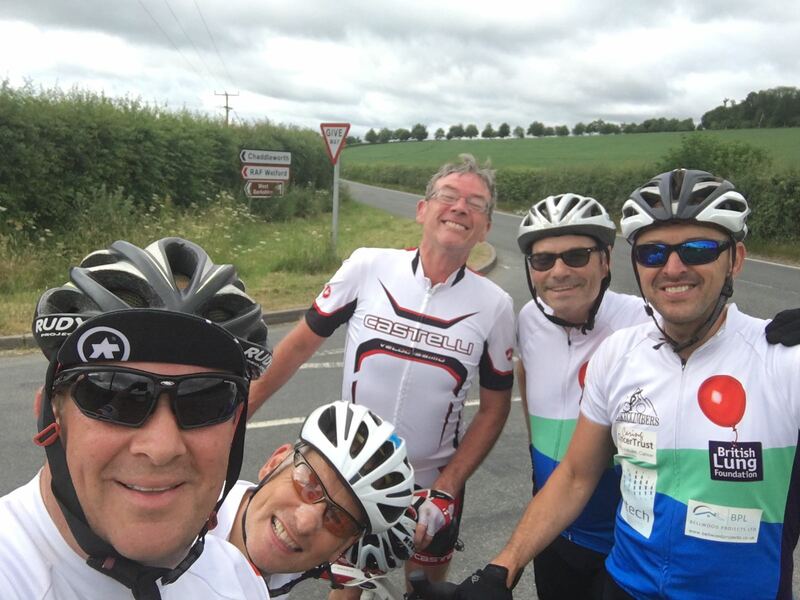 Mark and Macca pushed each other to the end and as we came into town we all grouped together, finally arriving back in plenty of time to return our impressive Pinarello bikes. What a day. What an experience. Where do we go from here?